A bio page for british author and Wizzley writer VH Folland. The wizzography and details for VH Folland, a British author of adventure fiction including Fire Season and The Docks. This page contains details of wizzley activities, a list of books, bio, random facts that interest me, wizzley articles, and places to find out more. Thank you for visiting and I hope you enjoy the page. On the work front, I'm a consultant in a specialist field, I've worked in a lot of industry sectors and I like aircraft and technology. One of my early memories is sitting on a pilot's lap while he taxied round the field, or at age four-ish standing by the hangar a Vulcan bomber was passing over - probably about a hundred feet over, as it came in to land - which was memorably loud and resulted in scabby knees when I fell over. I used to put my author notes on Squidoo, but as they have closed, the notes will be moving here. 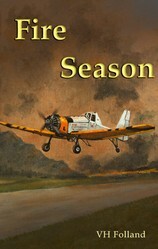 The story of a small town, a forest fire and a group of pilots. Fire Season was written as a stand alone novel, but there are a few extra short stories available covering events in and around Brooke's Vale. Standing Guard follows Fire Season by two years, covering a rescue attempt at sea. Arrival was a free short story released before Fire Season. Arrival was a free short story, release initially as a line a day through Twitter before it was assembled and released through Smashwords. Set two years before Fire Season, it covers the arrival of Matt's prize possession. For a few months it was the most downloaded free story on Smashwords, until - and I always enjoy this story - someone released a free bio of Justin Bieber. How many people outside the music industry can say it took Justin Bieber to knock them off the number one spot? The Docks was written as a stand alone short story, but there was so much demand to know what happened next that I wrote the second part Conflict of Interest. The is a hard admission for an author, but I don't like Conflict of Interest. I think Harry's story was wrapped up to my satisfaction in the first one. Going Under is the story of Karo a teenager who has dropped off the grid in London. This is an interesting one because when I wrote Fire Season the reviews all referred to the author as male. With Going Under, they unanimously referred to the author as female. It seems many readers assume that the author most be the gender of whatever their main character is. I'm taking it to mean I write both genders convincingly, which is actually rather flattering. It was part of a planned trilogy, but again I think I wrapped up the story in one. Few of the main characters would return and the setting would change, so I'm not sure there's anything more to say. Think "that's a good idea"
Pick up pen. Apply to notepad. Scribble frantically. Ignore odd looks. Get home. Look at half-filled pad. Sit in front of PC with coffee. Resign yourself to typing. Re-read. Think: "Is this nonsense?". Start researching every article you can find. Accept certain chunks can't happen that way. Curse quietly. Rewrite. Leave in publisher's capable hands because I've tried self-publishing and it is hard work! ... for four other notepads filled by step one and two while the initial idea was going through the process.